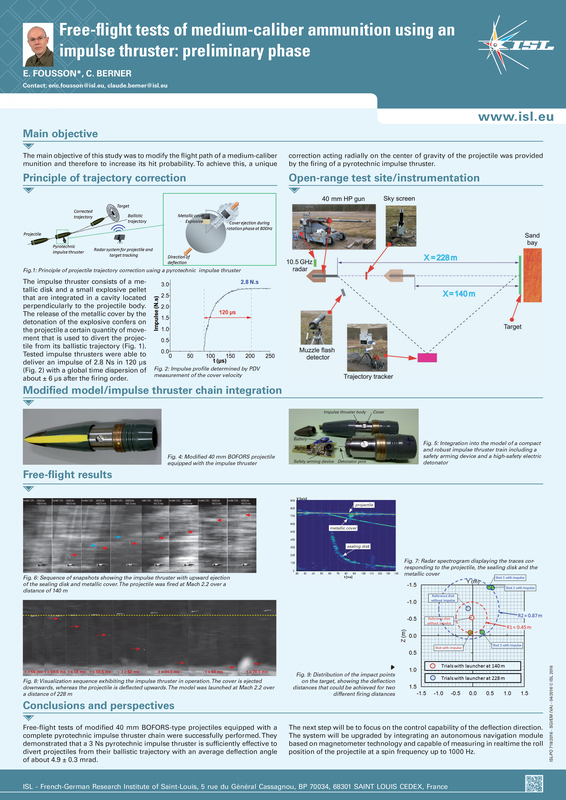 The South African Ballistics Organisation (SABO) Award gives recognition to the author(s) of the best poster as displayed and presented at the International Symposium on Ballistics. This award was instituted at the 25th Symposium in Beijing for the first time. The aim of this award is to inspire poster presenters to present their work in creative, legible and professional fashion in order to make the poster sessions special exchange of information events at the symposiums. The SABO award is a statue of the Zulu warrior Shaka, king of the Zulu nation. Shaka revolutionized the old techniques of warfare in Southern Africa. He observed that hurling the light throwing assegai at a distant enemy was mostly ineffective and was equivalent to throwing one’s weapon away. He developed the short, stout, stabbing assegai, especially designed for close combat. He converted the shield for use as an offensive weapon by lengthening the shield and using it to hook the shield of his opponent away, thus providing an opening to use the stabbing assegai. Additionally the use of sandals, which caused the wearer to slip more easily on the battlefield, was prohibited. Bare feet properly toughened through harsh preparation provided greater agility and mobility. Due to these fighting techniques, he and his warriors conquered and dominated South-Eastern Africa during his reign from 1818 to 1827. The poster session chairs evaluate the technical content of the research presented by the authors and they provide a maximum of three posters eligible for the award. This can be done prior to the symposium. The presence of the author(s) at the poster during the session is recorded and of paramount importance. The author(s) should also be able to explain his work satisfactorily to the relevant session chair. The nominations are reduced to one or at the most two by the session chairs by evaluating the visual layout and appeal. Please note that posters will be disqualified if their authors are requested to present their work in an oral session as this defeat the purpose of the award. The size of the poster must satisfy the guidelines of the symposium organisers, normally of A0 size (width x height: 841 x 1189 mm or 33.1 x 46.8 in). Care should be exercised against posters with too large a height, as it becomes difficult to read the bottom part. The top of the poster has a banner with the title of the paper, authors and affiliations. It is a good idea to mark the presenting author by an *. If required by the organisers, a photo may be added as well. The banner should not overwhelm the poster, but should be large enough to note from about 5 meters. The layout cannot be dictated, but should be clear, visually attractive and logical. Be concise and provide the minimum description of the technical content that still make sense. The font size should be legible from about 1 meter. The photographs and graphics should be relevant to the text and of good quality. References should be added according to the organisers’ guideline for publication in the proceedings. 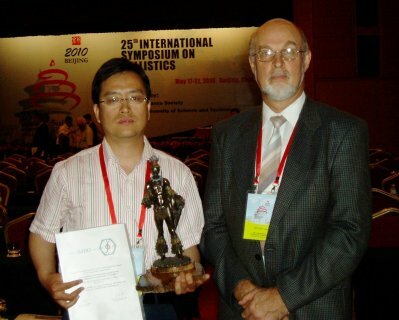 Dr Izak Snyman presented the first SABO award at the 25th ISB in Beijing to Mr. Chen-li TAO. 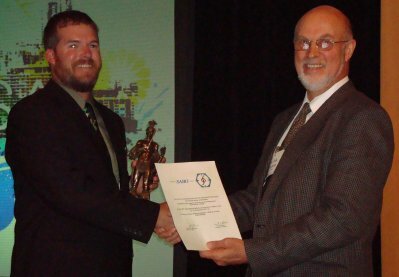 Dr Izak Snyman presented the second SABO award at the 26th ISB Miami to Mr Timothy Johnson. Dr Kassie Karsten presented the third SABO award at the 27th ISB Freiburg to Mr Hendrik Lips. Dr Izak Snyman presented the fourth SABO award at the 28th ISB Atlanta to Mr Long Nguyen. 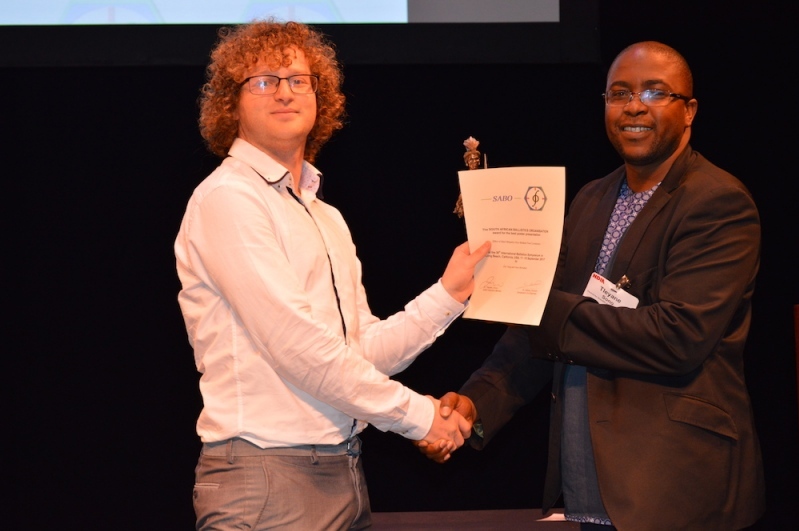 Dr Izak Snyman presented the fifth SABO award at the 29th ISB Edinburgh to Dr Claude Berner. 1 25: Beijing, China, May '10 TAO Chen-li, ZHANG Yu-rong, LI San-qun, JIA Chang-zhi, LI Yong-jian, ZHANG Xi-fa, HE Zheng-jia, for "Mechanism of Interior Ballistic Peak Phenomenon of Guns and its Effects"
2 26: Miami, USA, Sep '11 T Johnson, B Hinz, M West B Jasthi, M Ellingsen, C Widener, K Muci, for "Evaluation of the Response of Friction Stir Processed Panels Under Ballistic Loading"
3 27: Freiburg, Germany, Apr '13 H Lips, K Menke, for "Fox7/GAP Rocket Propellant for a Shoulder Launched Projectile"
4 28: Atlanta, USA, Sep '14 L Nguyen, S Ryan, S Cimpoeru, A Mouritz, A Orifici for "The Effect of Target Thickness on the Ballistic Performance of UHMW Polyethylene Composite"
5 29: Edinburgh, UK, May '16 E Fousson, C Berner for "Free Flight Tests of a Medium-Calibre Ammunition Using an Impulse Thruster: Preliminary Phase"
6 30: Long Beach, CA, US, Sep ' 17 Eric Yang, Huon Bornstein for "Effect of Blast Mitigation from Multiple Fluid Containers"